Echizen is blessed with an abundance of high-quality ingredients thanks to the natural resources found in the local mountains, countryside, and nearby sea. We use these seasonal ingredients to prepare exquisite dishes of the highest quality. 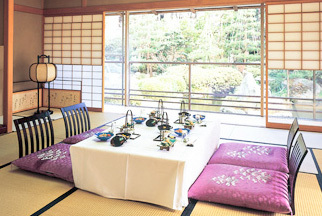 At the Kotobuki-tei Villa, traditional Japanese meals are served in the guest room or a small banquet room. 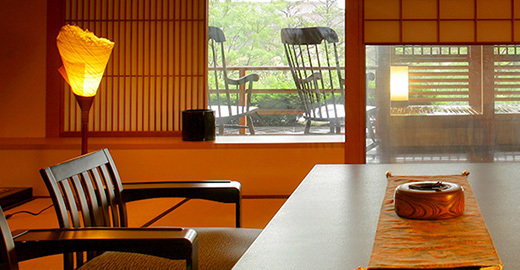 At our ryotei Yuuzen or our restaurant Tokinokura, guests can enjoy dining in a sophisticated atmosphere, slightly different to being in the guest rooms. At the Kotobuki-tei Villa, our head chef prepares traditional kaiseki course dishes of the highest quality, incorporating plenty of fresh ingredients from the surrounding area. We place importance on both the ingredients and presentation, ensuring each dish is the perfect accompaniment to your meal with family or loved ones. We invite you to enjoy the finest cuisine that Echizen has to offer, served either in your room or in a small banquet room. Yuuzen is our Japanese fine-dining restaurant, with all guests seated in their own private dining room or booth for maximum comfort and privacy. The dinner courses feature dishes of vivid color and presentation, with the chefs utilizing only the freshest and finest ingredients, each carefully selected on the day. All dishes are diligently prepared and served one-by-one, for the ultimate dining experience. Since the ingredients are selected on a daily basis, the menu will not be fixed in advance. The images above are sample dinner courses for guests staying in standard rooms of the main building (Kisuiden / Kansuiden) and Deluxe Rooms (Kousuiden). If guests choose to dine in the Tokinokura restaurant, there is also a buffet corner where you can help yourself to refills for rice, soup, pickles, and fruits. * Dishes vary by the season and may differ from those shown. * Please note that dishes may differ according to your reservation package. We can prepare special dishes to further enhance your dining experience. For example Echizen Crab (winter only), sashimi (raw fish), side dishes, fruit, and so on. The Echizen crab is a local delicacy, famous for being an annual offering made to the Imperial family. It lives in 250-300m deep waters in the Sea of Japan, and breeds at temperatures below 5 degrees Celsius. It is renowned for its succulent sweet taste, and comes with a yellow tag of authenticity worthy of its status as the "king of crabs". When is Echizen crab on the menu? The fishing season for Echizen crab runs from November 6th to March 20th every year, when the fishing ban is lifted. At our ryokan, packages that include Echizen crab dishes are available for the period of mid-November to mid-March. Does my plan include Echizen crab? Please check the details of your reservation. If it is included, it will be stated on your reservation package. If your reservation does not specifically state that it is included, it is not part of your package. I booked a regular accommodation package. Can I change to one that includes Echizen crab? Please cancel your current package and re-book a package that includes Echizen crab. Please note that a cancellation charge may be incurred. We can provide vegetarian meals if advance notice is given. *Please be sure to inform us when making your reservation. 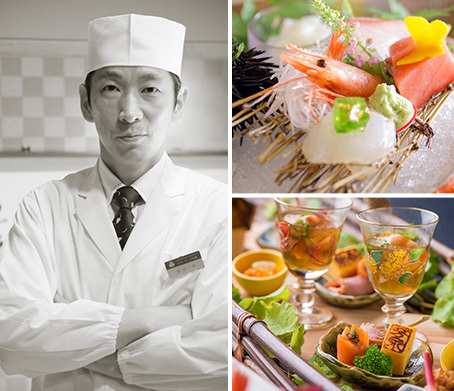 Being born in Wakayama and undergoing my training in Hakone, coming to Fukui has introduced me to the amazing array of ingredients it has to offer. There is wonderful fresh seafood from the Sea of Japan, and delicious vegetables from the local farms. It is my aim to bring out the full flavor of each ingredients for guests to enjoy. To ensure we reach our potential, we are constantly striving to broaden our knowledge of both cuisine and non-cuisine related concepts and ideas. At the same time, we will stay true to our original cooking values, and continue to prepare dishes with the same passion for quality and originality that we had when we first started out. I hope that you will enjoy our dishes and the dining experience with us. 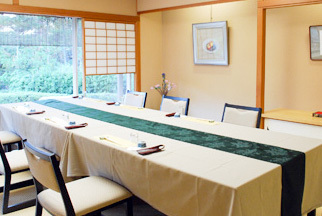 *The 3 banquet rooms of Unkai, Shouen, and Suigetsu are all for the exclusive use of the Kotobuki-tei Villa guests. 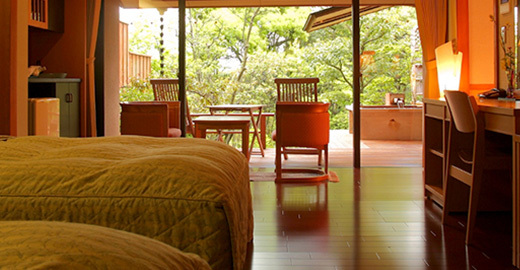 Kotobuki-tei Villa is a special, detached wing of the ryokan that provides privacy and tranquility. Boasting 16 luxurious suite rooms, guests can enjoy a serene and relaxing stay, along with the finest hospitality. A modern-Japanese, resort style wing that is overflowing with greenery, and where one can enjoy strolling along the traditional corridors and gazing out over the formal Japanese gardens. The perfect way to relax and let time slowly drift by. The service staff will not disturb you in your room; instead you can enjoy the same service style as in a hotel. The ultimate in luxury and elegance, in one room. The perfect place to escape from the hustle and bustle of city life. Everything is designed to ensure you enjoy the perfect vacation. 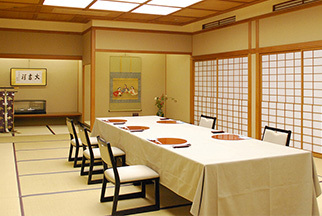 Kotobuki Kaiseki meals are served either in your room or in a small banquet room. Located on the 1st floor of the Kotobuki-tei Villa, these elegant suite rooms feature 80 square meters of space to relax in, as well as their own private open-air hot spring bath. Guests can enjoy a luxurious and peaceful time enveloped by nature, as the rooms are also surrounded by the Japanese garden. Guests can enjoy a relaxing soak in the open-air hot spring tub, while gazing at the sky. Our Kotobuki-tei Villa is designed to be a traditional and luxurious resort; a formal place where adults can relax and unwind. The Comfort Suite Rooms boast their own private, open-air hot spring tub, where guests can enjoy a relaxing soak while gazing at the sky. There are 3 deluxe rooms in the Yutorogi-tei Annex. All rooms are spacious and comfortable Japanese-Western style rooms with a private, open-air hot spring facing out over the garden. Yuuzen Kaiseki meals are served in our fine dining restaurant 'Yuuzen'. Facing out over the formal Japanese garden, and providing 40 square meters of space, these modern-Japanese rooms feature both a Japanese style room and a living area. These modern-Japanese rooms feature twin beds and a living area. Currently rooms 152, 162, and 166 are barrier-free rooms. 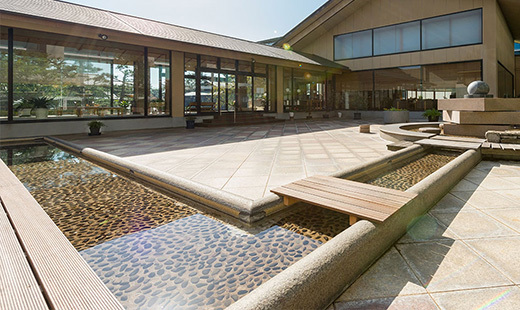 With 33 guest rooms boasting there own private outdoor hot springs, a recently renovated Tenjo no SPA in the main building, a footbath with massage stones, and a refurbished public hot spring for the exclusive use of guests staying at the Kotobuki-tei Villa or Yutorogi Annex, Grandia Housen truly is a hot spring paradise! Please enjoy the soothing nature of the Awara hot spring water on your skin. In 2017, the large public baths Tsuki-no-Yu (Moon Bath) and Hoshi-no-Yu (Star Bath) were renovated and refurbished, transforming them into comfortable and modern bathing facilities. The view from the outdoor hot spring allows bathers to enjoy the changing seasons of the Fukui countryside, and a beautiful night sky when the weather is fine. Please enjoy a relaxing time as you try out all the different baths on offer. The Hinoki large public bath is a luxurious bathing facility for the exclusive use of guests staying at the Kotobuki-tei Villa or Yutorogi-tei Annex. Enjoy the soothing sensation of the Awara water on your skin as you gaze out over the formal Japanese garden. Pure luxury in your room. Enjoy the ultimate experience of soothing relaxation, in the comfort of your own room. The modern Japanese lounge is the perfect relaxation space for those looking to spend a peaceful time in serene surroundings. Please enjoy a quiet moment away from the hustle and bustle of the outside world. Enjoy a dip in the foot bath at any time. Keeping your feet immersed in the soothing water will warm up your whole body, while walking on the cobbled floor will help to stimulate blood circulation. 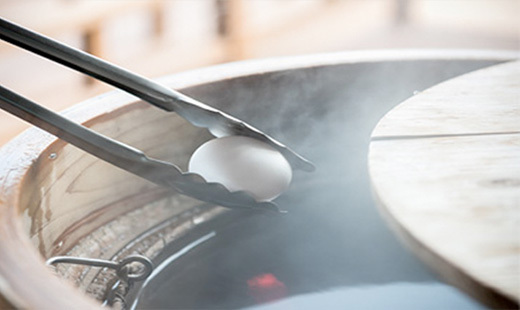 Guests can enjoy cooking their own "onsen egg", free of charge. Popular with both adults and children alike. 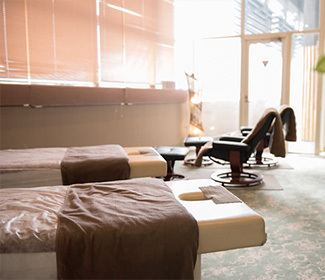 We offer a full range of esthetic and relaxation services to ensure your stay is as comfortable as possible. After dinner, guests can continue to enjoy their stay in Awara into the night. 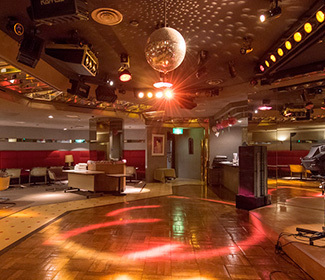 We have a karaoke bar, private karaoke rooms, mah-jong rooms, a Japanese noodle restaurant, and more. 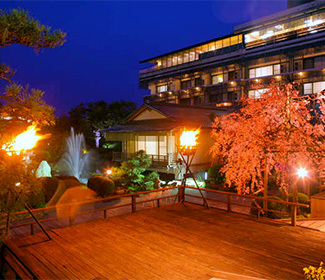 Illuminated at night, and overlooking the Japanese garden, it is a charming place to take a memorable photo of your trip. Information is available in English. There are some English speaking staff working on the front desk. We can also respond to inquiries in English by email (please allow up to 2-3 days for a response). Unfortunately we cannot handle inquiries in Korean or Chinese (simplified or traditional).